Ms. Dimperio hosts After School Tutorial on Tuesdays and Thursdays. 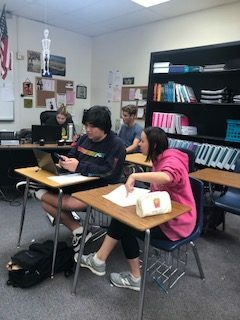 Almost every San Clemente High School student has heard of After School Tutorial, but many don’t know what it’s all about, or take advantage of the academic and social benefits it has to offer. I’ll admit I was even ignorant to what After School Tutorial was really all about until I went to one – and was surprised by how much of a welcoming environment it was. I don’t know why, but I expected it to be an utterly silent and strict setting. I suppose that the notion of doing homework in a classroom after school made me envision detention rather than what I actually walked into: a room full of students chattering away about math and English and Spanish and their plans after school. I immediately felt like I’d walked into a place where I was genuinely wanted and welcomed. Even though I’d never even been to a tutorial before and only knew a few people there, it wasn’t awkward – I felt like I belonged. The tutorial I went to was on Tuesday, and the Tuesday/Thursday tutorials differ from the Wednesday/Friday tutorials. On Tuesdays and Thursdays, tutorial is held in Mrs. Dimperio’s room, room 406, from 3:00-4:00. This tutorial is all student-ran and student-organized. “The Tuesday/Thursday tutorials are with Link Crew leaders as tutors,” said senior tutor and Link Crew Events Coordinator Chandler Eldridge, “which I think is nice, because sometimes kids feel awkward asking a teacher for help, so having other students makes tutoring more approachable.” This definitely seemed to be the case, as the dynamic between tutors and students was one of camaraderie, friendliness, and openness. Tutorial is also offered Mondays and Wednesdays in the library from 3:00 to 5:00. This tutorial has both teacher and student tutors, and not only is a place for students to do homework and get tutoring but also to make up missed tests and quizzes, and other make-up work. All tutorials are excellent places to get homework done as well as make up class work and get caught up on assignments. Being in tutorial really did feel like a place where everyone was approachable and genuinely wanted to talk about homework, or just life in general. “I always think it’s nice to get in the routine of coming here after school, having a place to do homework, and leaving with your homework done,” says Mrs. Dimperio. Needless to say, I encourage everyone to go to After School Tutorial to receive fast, free after school tutoring. I know I will definitely be going back!